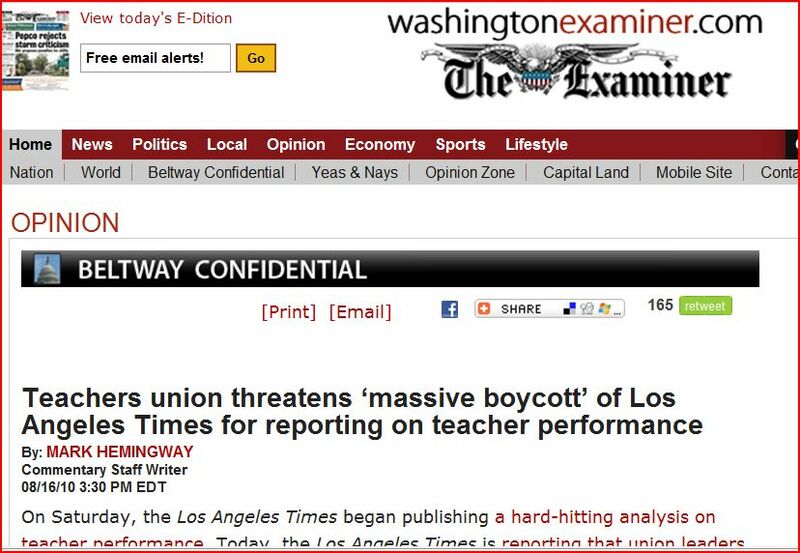 http://www.washingtonexaminer.com/opinion/blogs/beltway-confidential/teachers-union-threatens-massive-boycott-of-los-angeles-times-for-reporting-on-teacher-performance-100787679.html reports of a study by The Los Angeles Times on individual teacher performance and their pupils attainment has sparked controversy. The study and Los Angeles Times analysis, using data largely ignored by LAUSD, looks at which educators help students learn, and which hold them back. The relevance to Northern Ireland schools becomes clear when the outcomes are examined. Most of our educationalists act as though one teacher is about as good as another. As a result, the most effective teachers often go unrecognized, the keys to their success rarely studied. Ineffective teachers often face no consequences and get no extra help. Which teacher a child gets is usually an accident of fate, in which the progress of some students is hindered while others just steps away thrive. Though the N.I. government spends billions of pounds every year on education, relatively little of the money has gone to figuring out which teachers are effective and why. The ETI have much to answer for. Their reaction to this story and the study carried out by non teaching professionals will indicate who has priority and who is important in the N. Ireland education world. In Los Angeles the teachers have placed themselves at the front of the line. Are they likely to become the first casualties? A Times investigation found that the Los Angeles Unified School District routinely grants tenure to new teachers after cursory reviews — and sometimes none at all. Evaluating new teachers for tenure is one of a principal’s most important responsibilities. Once instructors have permanent status, they are almost never fired for performance reasons alone. The two-year probation period, during which teachers can be fired at will, offers a singular opportunity to weed out poor performers.